Thapar heard arguments from both sides about possible downward departure from the sentencing guidelines, and allocution from each defendant. He said that he wanted to hand down a severe enough sentence to deter them and others from engaging in similar disarmament actions in the future. Defendants reserved the right to appeal. Sentencing of the three began on January 28, but the hearing that day was continued until today when a worsening winter storm forced early closure of the courthouse. The proceedings on both days were broadcast by closed circuit television into a second courtroom to accommodate the crowd of supporters on hand. Before adjourning in January, Judge Thapar heard testimony from friends of each of the defendants, about their good works in their communities: Rice’s life-long family friend, Yale University scholar Mary Evelyn Tucker; Walli’s fellow Washington, D.C. Catholic Worker community member Kathy Boylan; Boertje-Obed and Walli’s friends from the midwest, 87-year-old veteran Andy Anderson and Nukewatch co-director John LaForge. Assistant U.S. attorney Jeff Theodore, the lead prosecutor, used the occasion to further ridicule and demean the defendants, saying they were “disingenuous” about their commitment to peace and justice, and challenging Boylan and LaForge about their own criminal convictions in peace actions. Early on the morning of July 28, 2012, the three veteran activists hiked over a ridge and cut through four fences to reach the United States’ new storehouse for bomb-grade, highly enriched uranium at the Y-12 nuclear weapons complex. At the base of the concrete fortress they strung crime scene tape between the pillars, poured blood on the walls, lit candles and hung two banners reading “Transform Now Plowshares” and “Swords into Plowshares, Spears into Pruning Hooks – Isaiah.” With their hammers, they began chipping away at the building’s foundation. When the first security officer arrived on the scene, the trio broke bread to share as a peace offering. They took action in the 33-year Plowshares tradition of more than 100 predominantly faith-based acts of direct disarmament around the world. Their arrest led to a temporary shutdown of Y-12 operations, oversight hearings in Congress, and on-going security overhauls throughout the nuclear weapons enterprise. 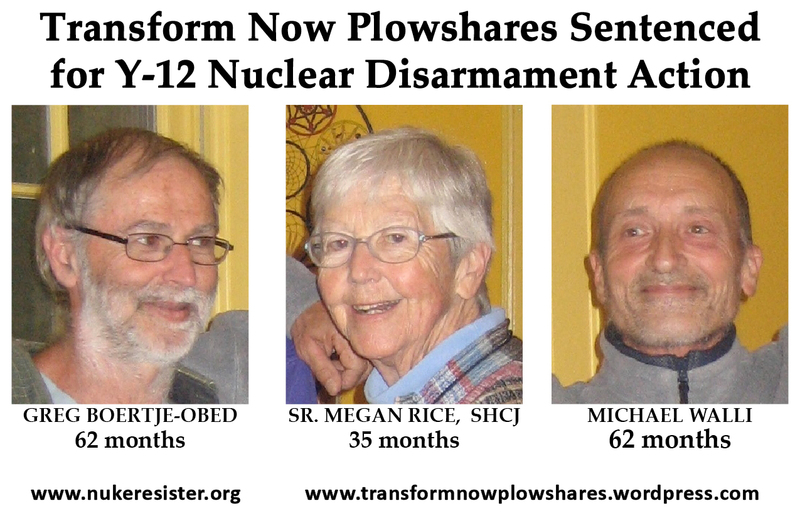 For more information, visit the Transformation Now Plowshares blog here. Judge Amul R. Thapar passed sentence on Greg Boertje-Obed, Megan Rice and Michael Walli on Tuesday, February 18, 2014 in federal court in Knoxville, Tennessee. 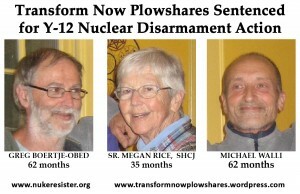 The three were convicted in May 2013 for their nonviolent action called Transform Now Plowshares at the Y12 Nuclear Weapons Complex in Oak Ridge, Tennessee, on charges of depredation of property and sabotage—the convictions carried possible maximum sentences of 30 years in prison. Sentencing guidelines, based on factors including history, recommended sentences ranging from 6-10 years. Sentencing began at 1:30pm; the three were permitted to be in the courtroom together by Judge Thapar. Michael Walli received a sentence of 62 months on each count, to be served concurrently, followed by 3 years of supervised release. Greg Boertje-Obed received a sentence of 62 months on each count, to be served concurrently, followed by 3 years of supervised release. Megan Rice received a sentence of 35 months on each count, to be served concurrently, followed by 3 years of supervised probation. The statement issued at the time declared the United States in violation of the Nuclear Nonproliferation Treaty and said Y12 was chosen for the action because of plans for a multi-billion dollar bomb plant to be built there—the Uranium Processing Facility. The sole purpose of the UPF (pricetag now $19 billion) is to produce thermonuclear cores for warheads and bombs. Y12 is an active weapons production facility—workers today are performing Life Extension Upgrades on the W76 warhead at Y12. *Stated that he was offended by the fact that the Nazi regime had a legal right to exist and that either by silence or overt support Catholics consented to it. *Stated that he acted in accordance with Jesus. Jesus’ declaration “Blessed are the peacemakers” was a call to action. *In response to a comment made during the hearing by U.S. District Attorney Jeff Theodore, he stated that we both have something in common in admiring Rosa Parks as he commended him for sitting on the same seat of the bus that Rosa Parks was arrested in during a visit he made to Michigan where the bus was on display. *Read the TNP action indictment. *Read an excerpt of Dr. King’s “Beyond Vietnam” speech re: why he opposed the Vietnam war. *One of the great problems is that people don’t know the 70 year history of nuclear weapons and the secrecy that surrounds nuclear policy. Encouraged the Judge and everyone in court to read the book Full Body Burden: Growing Up in the Nuclear Shadow of Rocky Flats by Kristen Iversen. *Spoke of how every single day and all of life is a miracle and how the Bomb is a threat to that miracle. *Referred to the book A Beautiful Mind and how many of the best minds today agree that there is an alternative to nuclear weapons. *Spoke of a “cloud of deception” surrounding the economic extortion going on at Y-12 and that this was never mentioned at the first sentencing hearing regarding the restitution the TNP were ordered to pay. *Acknowledged the support the TNP have received from all over the world and showed the court a signed card from the Afghan Youth Volunteers that was recently sent to her by Kathy Kelly. *Appealed to the judge not to show leniency toward her and that it would be an honor to spend the rest of her life in prison. *Spoke of the injustice she has witnessed firsthand in the for profit detention complex and the dehumanizing jail conditions. *Spoke of the connections between the rich controlling the wealth and resources at the expense of the poor and how the military budget constitutes a theft from the poor. *Cited an Appeal Court’s overturning the conviction of the Plowshares Eight and Appelate Judge Spaeth’s Opinion regarding the catastrophic danger posed by nuclear weapons. *Referred to German Judge Ulf Panzer who was arrested for opposing the deployment of Pershing II nuclear missiles at the U.S. air base in Mutlangen in 1987 and Lawyers and Jurists worldwide who declared nuclear weapons to be illegal. *Judge granted her request to sing the song “Sacred the Land.” All present in the main courtroom and the overflow courtroom joined in singing the song. (On February 17 a beautiful Festival of Hope for the Transform Now Plowshares was held at the Church of the Savior in Knoxville, Tennessee. The evening including many inspiring words, stories, poems and songs, including an amazing new song about the Transform Now Plowshares by Ralph Hutchison. Below is the reflection I offered). I would like to express deep gratitude to the OREPA Community who have welcomed with a loving embrace all who have come from out of town to attended tomorrow’s sentencing. The OREPA community, who has been witnessing for peace at Y-12 for 25 years, is such a great sign of hope for us all. I also want to thank Michele Naar-Obed (Greg’s wife) for for being such a great sign of hope. And I thank all of you present for the great hope you are and offer to our world. And we are so very grateful to Greg, Mike and Sr. Megan for their lifegiving act of hope and courage! In pondering the theme of tonight’s celebration–Hope–I turned to the scriptures. I would like to share the following scripture passage, a quote about hope and a meditation that that the Spirit moved me to write. Hope, that consummate virtue, that inspiring beatitude, grounded in an unwavering faith. that love will ultimately triumph! Throughout the annuls of history hope abounds! birthing a new creation, practicing Resurrection! that the forces of death will never prevail. Remember, the Risen One has conquered the world! the promise will be fulfilled!